Michael and I flew to Melbourne after I finished work. We were staying in the Space Hotel. But even its executive ensuite was tiny. Michael nicknamed it the No-Space Hotel. I lay our suitcases side by side inside the wardrobe, brought in a chair from the balcony, and lined up all movable items against the walls. Michael could only supervise me; his back was too sore. 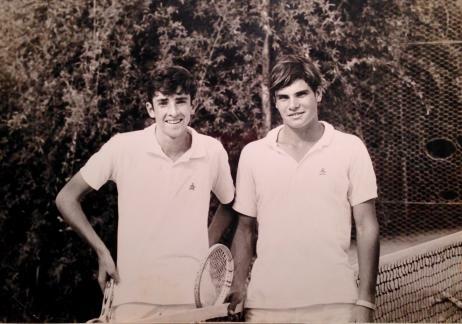 Michael was very athletic in his youth, winning junior tennis championships in NSW and the ACT, and later represented Australia at international squash tournaments. But in the last decade, he had suffered from complex connective tissue disorder and inflammatory conditions. Two years ago, his lumbo-sacral disc herniated. Fragments of the disc material broke off, travelled upwards in his spinal canal, and lodged at the exit route of a major nerve. He had severe pain and lost control of his left leg. He underwent spinal surgery to remove the fragments and decompress the nerve. He then endured two years of rehabilitation. In spite of his perseverance, the damaged nerve never fully recovered. He lost power and bone density in his left leg, developed ferocious cramps at night, and muscles in his left foot atrophied. He used to be a couple of centimetres taller than me, now slightly shorter. Our greatest fear was that the damaged disc, with its protective sheath permanently breached, might re-herniate. He had recently developed new pains in his right lower back and hip, and this was worrying. By the time we settled in, it was already 9:30pm. We had been given mock tofu in chewy bread for dinner on the plane, which we had to throw away. The hotel was located opposite RMIT and the Old Melbourne Gaol, where Russell Street joins Lygon. It would take ten minutes to walk to the nearest restaurant. While I was calculating the pros and cons of the various dinner options, Michael announced that he had brought a lunchbox of homemade tempeh and real tofu. He then went into the industrial-sized kitchen to heat up the food. partner in crime in doubles. For the first time in my life, I was going to be on live radio. I got up early. I had researched tips for media interviews from a handful of websites. They unanimously suggested good preparation. But I had been so preoccupied with the book launch in Sydney the last Sunday, that I had left the most critical step to the last minute! Michael’s pain had worsened overnight. Maybe the bed was not quite right, or the full impact of the flight had just become apparent. He slowly got dressed, and dragged his feet into the Melbourne morning, leaving me to my preparation. Fifteen minutes later, he returned with coffee and then made me muesli for breakfast. He had brought the muesli from home too. The front desk organised a taxi for us. The weather was clear, cold and windy. The wintery light and the blowing leaves beguiled me. We drove through the CBD. A thin man in ragged clothes ambled in the middle of the road. Our Indian driver beeped at him. He returned a rude finger, to which the driver only shook his head. We passed by the yellow landmark of Flinders Station, crossed the Yarra River. Outside the sombre walls of the NGV, the dropdown canvas advertised the Degas exhibition. We love Degas and had seen many of his original works in Paris. We decided we’d go to the exhibition the next day, after my last interview was finished. ABC Melbourne was undergoing renovation. We found our way to the reception at the back. The two other guests soon arrived and the producer ushered us through a labyrinth of work-in-progress to a dimly lit area outside the studio. Through the porthole, we could see Jon Faine talking into the microphone, and through the speakers on the walls, we could hear him, except his mouth didn’t match his words. The producer told us that the slight delay was intentional. While watching Jon, I understood why I wanted to be a writer. I could never speak so eloquently, so unremittingly. I had opted for the gradualness and prudence of pen and paper, where words could be laid out and arranged to satisfaction. Sophie Black was first on, and I was to be next. From what I could hear, Jon seemed to have put her on the spot, but she didn’t falter. I couldn’t focus on the conversation because I had started pacing out of nervousness. Melanie_Cheng tried to calm me down. Then it was time. I was in the studio, microphone in front, headpiece on. Jon steered the conversation so skilfully, I became engrossed in the topics at hand and the nerves were gone. Later Melanie joined in, and we had a delightful conversation. I looked out the porthole. Michael was there, nodding, smiling at me. The next interview was with 3CR, a community radio station run by volunteers. We were five minutes late, but David McLean was gracious and put us at ease. The studio was less formal, and he was at once the interviewer, the producer and the technician. What amazed me was how the different interviewers had been able to draw different insights, and thereby sparked different responses from me. We were in Fitzroy. The sun was higher now, casting strong shadows. Having grown up at high latitude in the northern hemisphere, I fell for a day like this. The wind was cold and threatened to blow my hat away. I had to take it off. Luckily, Michael had brought an extra beanie. We walked along the streets in search of lunch, and found a spacious vegetarian café. We shared a soup and a mixed plate. Michael’s back had been very painful, but he was in good spirits, marvelling at the interviews, enjoying the food, agreeing with me that Melbourne people were more relaxed and dressed more fashionably. I spent the rest of the afternoon preparing for the evening book launch, while Michael took a nap. He was worn out. In the evening, we walked up Lygon Street to Readings. The launch was a Q&A with Michelle Wright in front of a small audience in an area partitioned by bookshelves. Michelle looked just as beautiful as she was in all her photographs. I was touched by how well she had read A Chinese Affair, discerning all the nuances and subtleties. The audience was warm and welcoming, and asked wonderful questions. Michael couldn’t sit down. He stood behind the last row, listening. When we came back to the hotel, Michael started to show the early symptoms of a cold. He sneezed uncontrollably, which was very scary because anyone could herniate from the sheer internal pressure of a sneeze. He had to get up many times during the night, due to coughs, sneezes, back pain, and cramps. But I slept right through all that. I woke early to prepare for the last interview, with ABC Chinese Portal. The producer had outlined some questions beforehand. I structured my thoughts and wrote them down on a collection of palm cards, while Michael went out to buy coffee. We had to make a decision whether he would come with me, and we agreed it was best for us to stay together. ABC International had been relocated to Elsternwick while the Southbank building was under renovation. We drove through the sweeping streetscape of St Kilda Road. Our taxi driver was from Ethiopia. He told us about the corruption of the government there and the effort from Ethiopians overseas to support the democratic movement. We arrived outside the ABC office at the end of Selwyn Street, opposite the Holocaust Museum. In a makeshift studio with a mattress on the window for soundproofing, Mo Xiaoning and I had a long chat about A Chinese Affair. She also told me that Jon Faine was one of ABC’s ‘famous mouths’, a Chinese expression for top presenters. The room was so dusty Michael had to wrap his beanie over his mouth to hold back sneezes. Xiaoning showed us their office, which looked like wartime intelligence headquarters with rows of tables and chairs all facing the same direction. I met her lovely team and waved to their boss who wanted to have coffee with us but was trapped in the middle of a telephone interview. One of Xiaoning’s colleagues borrowed a camera and we walked down the sunny road for a photo shoot. Despite the staging effort, I was hopeless at posing. Just then, a man wearing a yarmulke walked by and he contorted his face to make me laugh. Xiaoning walked us to the main road. It was so hard to say good-bye. Glen Huntly Road was lined with beautiful old buildings. A few blocks up the road, we found another spacious vegetarian café. The queenly Indian boss was hiring staff. She talked to the candidates at a table outside in the bright sunlight, squinting, sipping her coffee, and jotting down notes on a clipboard. We were now free. We considered whether to go back to the hotel, but decided to go to the NGV and see how Michael might cope. We got on a bus operated by a driver and a trainee, winding through the wealthy suburbs dotted with Victorian houses, watching the weather changing its mind. Michael stood the whole way. By the time we got to the NGV, it had started to drizzle. We bought tickets to the Degas exhibition, which had an amazing scale. I recognised some of the paintings I had seen in the Chicago Art Institute. But Michael was too distracted to enjoy the viewing. He went outside to wait for me. I couldn’t concentrate either. When I came out, the rain had stopped. We took a walk in Queen Victoria Park, around the pond and among the sombre sculptures. Next to the mutilated statue of Queen Victoria, a young couple practised their hip hop routine. We got on the tram to a Hare Krishna place, and bought plenty of takeaway food. Michael picked up a bottle of wine to celebrate our last night in Melbourne. Tomorrow, we’d be flying home. We were glad when we got back to our room. I brought the balcony table in, and set it up. We ate an almost proper dinner. And after that, we watched Midsomer Murders until around 10pm. Michael was feeling a bit better. He lay on his stomach, stretched his back, and visited the bathroom. When he came out, he could no longer stand upright. He leaned on the wall and made his way to opposite the bed, but had trouble reaching it. I helped him to lie on his back, and tucked a pillow under his knees. His legs were shaking violently, seizing, as if he was being electrocuted. His eyes were wide. I was terrified, watching him losing his legs. I dialled 000. My call was instantly answered, then passed on, and then passed on and on. Each new person responded with utter sincerity, but still we had to repeat what we had already said, and each new person asked for more information than the previous person, so the conversations became longer and longer. Finally, they agreed to send an ambulance. We thought we should prepare for the worst – another disc herniation, major surgery, being stranded in Melbourne. I packed what I could think of for the night. The paramedics arrived. The girl was in charge and she called Michael ‘mate’. She took a brief medical history and asked the boy to measure Michael’s heartrate and blood pressure. The No-Space Hotel indeed had no space for a stretcher. The boy and I managed to get Michael off the bed. We shuffled into the lift together like an alien creature with six feet. Once we got outside the hotel, he pulled down the stretcher and hoisted Michael into the back of the ambulance. I sat at the front with the boy, while the girl stayed with Michael. There was some confusion as to which hospital to take him, but the boy figured it out and drove us to St Vincent’s, less than 1km away. He told me he was doing his last year at university. He asked why we were in Melbourne, and took great interest in my book. At the Emergency Department, the triage nurse had a minor altercation with the paramedics over how Michael should be brought in. They settled on a wheelchair. Michael sat down gingerly, and I placed his feet on the footrests. It was almost midnight when we checked in. In the emergency ward one had to take one’s own initiative. Michael needed pillows under his knees. I didn’t know whom to ask. Then I saw the paramedic boy, hanging out with the security guards, so I asked him. He looked around and saw behind him on the trolley shelf two pillows and two clean pillowcases. We put the cases on and I brought the pillows back. The hospital bed was adjustable but Michael needed support under his head. There were no more pillows. Then I realised that in my haste, I had slipped on five of Michael’s merino shirts. I took two off and made a little headrest for him. I wasn’t given a chair, but found a stool and wheeled it into our cubicle. Michael didn’t want to take the painkillers, because he didn’t want his symptoms masked before the examination. The nurse was surprised, stressing that he was fourth in line. We thought that shouldn’t be too long. Only later was the nurse proved right. For now, we started waiting. We were not alone. A man from the other side of the partition groaned periodically. I saw him, unattended, unkempt, a drip hanging over his head. Michael wanted me to go back to the hotel and get some sleep. I refused, and proved myself useful by finding a much needed urine bottle for him. We reviewed our options. He wanted me to fly back to Sydney on our midday flight. I refused. We must stay together in a time of crisis. We had one simple wish: to sleep in our own bed again. We waited. I gave Michael plenty of water, and managed the urine bottle. He was agitated. I tried to hypnotise him but only made myself drowsy. A couple of hours had passed, and the doctor still didn’t appear. The nurse, who was grumpy from being overworked, told us it had been a busy night. We were still fourth in line. At some stage, Michael’s legs had stopped shaking. Under his instruction, I performed some preliminary examination: raising his legs up one at a time, testing the pain level. It wasn’t getting worse. We were heartened: even if the disc had herniated, at least there was no major nerve compression like last time. At five o’clock, a young doctor appeared at our curtain, looking calm but exhausted. She took the medical history, and then went away. Half an hour later, she came back to conduct the physical examination. She and Michael soon started speaking in medical terms like dorsiflexion, plantar flexion, PR, and the conversation became more animated. She had just researched the latest techniques in ascertaining if there had been a disc herniation. After applying it, she concluded that there was no urgency for imaging, and Michael could take the midday flight with painkillers, and follow up with investigations back in Sydney. I dressed Michael and helped him onto his feet. He could keep himself upright now without his legs giving way. It was dark outside, the city still asleep, a lone taxi waiting. The driver was another Ethiopian gentleman, older. He praised God and assured us that if we prayed, God would heal Michael’s back. Since we were not going to pray, he was going to pray for us. We had an hour’s sleep in the hotel, or I did. When I woke, Michael was already dressed, determined to go out to get his coffee. He did. Then I did the packing, all the while admonishing, to stop Michael from helping. We made it to the airport, to our flight, to Sydney, to the long term parking, to our car, and then, home. We defrosted the food Michael had prepared before we left, and had an early dinner. Then he remembered it was rubbish night. He watched me tying up the rubbish bag, and came with me downstairs. Holding a torch, he led me through the garden path to where the bins were kept, and pointed me to our bin. Taking rubbish out was another domestic duty that I had been spared in the name of literature. We slept at 7:30pm, in our own bed, the happiest ending to my first book tour.